If you know me, then you’ll know that “Guilty Robots, Happy Dogs” pretty much had me at the title. It’s obviously very relevant to our interests at BERG, and I’ve been trying to read up around the area of AI, robotics and companions species for a while. Struggled to get thought it to be honest – I find philosophy a grind to read. My eyes slip off the words and I have to read everything twice to understand it. My highlights from Kindle below, and my emboldening on bits that really struck home for me. Here’s a review by Daniel Dennett for luck. Or to be more specific, the fetishisation of the things. To be clear, I like things. I even own some of them. Also, my company enjoys making and selling things, and has plans to make and sell more. However, in terms of the near-term future of technology – I’m not nearly as interested in making things as making spimes. Spimes and the Internet Of Things get used interchangeably in discussion these days, but I think it’s worth making a distinction between things and spimes. 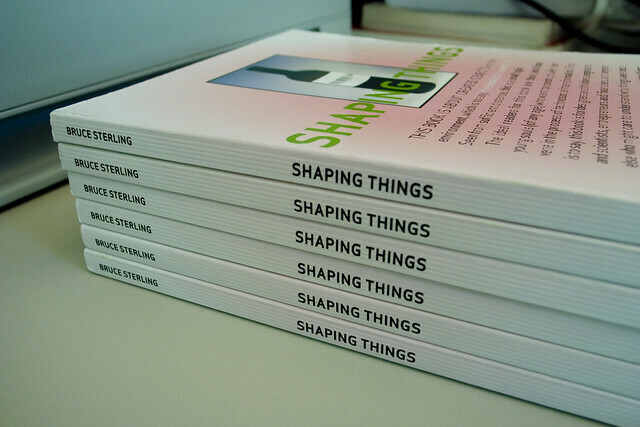 That distinction is of course best put by the coiner of the term, Bruce Sterling – in his book which is the cause of so much of this ruckus, “Shaping Things“. I’m going to take three quotes defining the Spime from Shaping Things as picked out by Tristan Ferne in, coincidently, a post about Olinda. “…the object is no longer an object, but an instantiation” – this sticks with me. A spime is an ongoing means, not an end, like a thing. As I say, I enjoy things, and working in a company where there are real product designers (I am not one). A while ago, back when people used to write comments on blogs, rather than just spambots, I wrote about the dematerialisation of product through the expansion of service-models into domains previously centred around product ownership. It was partly inspired by Bruce’s last Viridian note, and John Thackara‘s writing on the subject amongst others. But now I feel ‘Unproduct‘ is a bit one-sided. The stuff I was struggling towards in negroponte switch has become more important. The unmet (and often unstated) need for a physical ‘attention anchor’ or ‘service avatar’ as Mike Kuniavsky puts it in his excellent book ‘Smart Things‘. It is something we are attuned to as creatures evolved of a ‘middle world’. It is something we invest emotion, value and memory in. Also, a new language of product is possible, and important as the surface of larger systems. I tried to pick at this with ‘Mujicomp‘. A product design language for the tips of large service-icebergs: normalising legibility, fluent and thresholding. Things that are clear, and evident – unmagical (magic implies opacity, occulting of meaning, mystery and hence a power-relationship) but delightful, humble, speaking-in-human, smart as a puppy. And perhaps, just perhaps – by edging them toward being spimes, they can become fewer-in-number, better made, more adaptive to our needs and context, better at leaving our lives and being remade. Another thing I’m re-evaluating are glowing rectangles. I’ve long held somewhat of a [super]position that the more we can act and operate in and on-the-world rather than through a screen – the better. I’m not sure it’s as clear as that anymore. The technological and economic momentum of the glowing rectangle is such that, barring peak-indium or other yet-unseen black-swans getting in the way, personally-owned screens full of software and sensors reacting to a ‘dumb’ physical world seems to be a safer bet for near-to-mid-term futures, rather than ‘ubiquitous’ physical-computing based in the environment or municipal infrastructures. A lot of friends are at an event right now called “Laptops & Looms”, debating exactly these topics. Russell Davies, who organised it, wrote something recently that prompted this chain of thought, and I wish I could have been there to chat about this with him, as he’s usually got something wise to say on these matters. Work commitments mean I can’t be there unfortunately, but I know they are querying and challenging some of the assumptions of the last decade of interaction design, technology and punditry as much as possible. The hype about 3d printing, ubiquitous computing and augmented reality could really be grounded by the personal experiences of a lot of people attending the event, who know the reality of working within them – they have practical experience of the opportunities they afford and the constraints they present. I really hope that there will be lots to read and digest from it. Personally, returning to the source of some of these thoguhts, Bruce’s Shaping Things – has been incredibly helpful. Just reminding oneself of the wikipedia clift-notes on Spimes has been galvanising. Physical products are fantastic things to think about and attempt to design. And, bloody hard to do well. But a new type of product, a new type of thing that begins and ends in data, and is a thing only occasionally – this is possible too – along with new modes of consumption and commerce it may bring. The network is as important to think about as the things. The flows and the nodes. 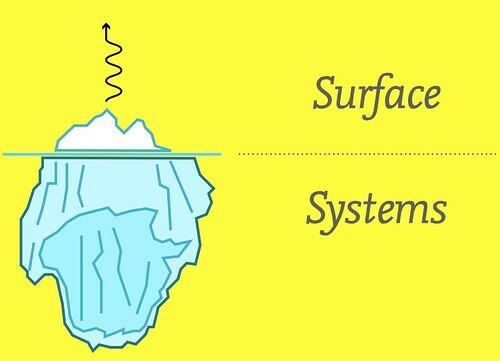 The systems and the surface. The means and the ends. The phrase “Internet Of Things” will probably sound as silly to someone living in a spime-ridden future as 1990s visions of “Cyberspace”, as distinct realm we would ‘jack into’ seem to us now as we experience the mundane-yet-miraculous influence of internet-connected smartphones on our ‘real’ geographies. In that sense it is useful – as a provocation, and a stimulus to think new thoughts about the technology around us. It just doesn’t capture my imagination in the same way as the Spime did. You don’t have to agree. I don’t have to be right. There’s a reason I’ve posted it here on my blog rather than that of my company. This is probably a rambling rant useless to all but myself. It’s a bit of summing-up and setting-aside and starting again for me. This is going to be really hard and it isn’t going to be done by blogging about it, it’s going to be done by doing. This is just what I what I want to help do. Still. Better shut-up and get on with it. Ben Bashford’s writing about ‘Emoticomp‘ – the practicalities of working as a designer of objects and systems that have behaviour and perhaps ‘ intelligence’ built-into them. It touches on stuff I’ve talked/written about here and over on the BERG blog – but moves out of speculation and theory to the foothills of the future: being a jobbing designer working on this stuff, and how one might attack such problems. I really think we should be working on developing new tools for doing this. One idea I’ve had is system/object personas. Interaction designers are used to using personas (research based user archetypes) to describe the types of people that will use the thing they’re designing – their background, their needs and the like but I’m not sure if we’ve ever really explored the use of personas or character documentation to describe the product themselves. What does the object want? How does it feel about it? If it can sense its location and conditions how could that affect its behaviour? This kind of thing could be incredibly powerful and would allow us to develop principles for creating the finer details of the object’s behaviour. I’ve used a system persona before while designing a website for young photographers. The way we developed it was through focus groups with potential users to establish the personality traits of people they felt closest to, trusted and would turn to for guidance. This research helped is establish the facets of a personality statement that influenced the tone of the copy at certain points along the user journeys and helped the messaging form a coherent whole. It was useful at the time but I genuinely believe this approach can be adapted and extended further. I think you could develop a persona for every touchpoint of the connected object’s service. Maybe it could be the same persona if the thing is to feel strong and omnipresent but maybe you could use different personas for each touchpoint if you’re trying to bring out the connectedness of everything at a slightly more human level. This all sounds a bit like strategy or planning doesn’t it? A bit like brand principles. We probably need to talk to those guys a bit more too. 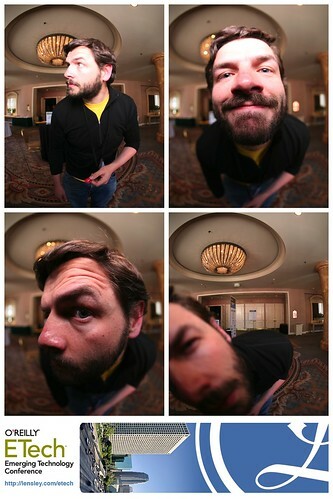 ETech 2009: Strip 0079, originally uploaded by Lensley Automatic. After the BLDGBLOG lecture at UCL last week, Mark, Russell, James and myself retired to the Malborough Arms for post-match analysis; and Russell dropped on us the fact that Roll-Royce’s jet engines are now prolific bloggers. They twitter about what they are doing back home to Derby from wherever they are above the globe, 33000 feet up. Of course, there must be an entire swathe of giant things that blog, and have been blogging since the dawn of telemetry; but it still seems faintly magical. Many have commented on Google’s new version of Google Mobile Maps, and specifically it’s “My Location” feature. Carlo Longino homes in on the fact that it provides, finally, a somewhat humane and useful basis for a lot of the location-based services use-cases that mobile service providers and product marketers have salivated over for around a decade. GMMv2.0 is sufficiently-advanced technology, not because of the concept behind it (location via cell network is pretty known) but the sheer, apparent quality of execution, simplicity and joy injected into the thing. This is something till now missing from most if not all mobile software, especially Symbian software. Janne once said to me: “no-one codes symbian apps for fun”, and it shows. It’s enough to get the things working for most developers, and as they’re mostly doing it for a salary rather than fun, they walk away before the joy gets injected, or don’t argue when it gets de-scoped. GMMv2.0 has some of the lovely touches that we’ve seen from the iPhone implementation carried over – like the location pins dropping into place with a little restitutional bounce. Just. So. It seems quicker and more focussed that v1.0, with location search features working to give the bare-bones info right there on the map rather than breaking-frame to a dialog. The main, huge, thing though is MyLocation. , which argued against relying on GPS and ‘satnav’ metaphors for location services. I don’t know if they downloaded his presentation in Mountain View, but GMMv2.0 delivers on Chris’s vision by not only using cellular location fiding, but how it interprets and displays it. By ditching the assumption that all location tasks are about a -> b in a car, and presenting a fuzzy, more-humane interpretation of your location – it gives a wonderful foundation for wayfinding, particularly while walking, which hopefully they’ll build on. In other possible advantages that “Do not use while driving” gives you is it become a resource you can use indoors, where I’d guess 90% discussions about where to go and what to do actually happen, and where 90% of GPS’s won’t ever work. Other contenders in the mobile wayfinding world seem to be pursuing interfaces built on the metaphors and assumptions of the car-bound “satnav” world e.g. Nokia Maps. Probably as a side-effect of most of their senior management driving to work in suburban technology parks everyday! Actually, Nokia Maps (at least the last version I used, I switched to GMM and haven’t returned) does something even more bizarre when it starts up and shows you a view of the entire earth’s globe from orbit! I cannot think of a less user-centred, task-appropriate entry point into an application! The Google mobile team are to be congratulated not only for technical innovation in GMMv2.0, but also having the user-experience savvy to step beyond established cliche in a hot area and think in a context-sensitive, user-centred way about the problem.